Former bantamweight king Dominick Cruz will be making his long-awaited return to the Octagon for the first time in over two years when he makes his Octagon return against #6 ranked John Lineker. The initial report of the bout was broken by the Orange County Register on Wednesday, and sources close to MMA News have confirmed that verbal agreements are in place for the bout to transpire at UFC 233 on January 26th from the Honda Center in Anaheim, California. We have not seen Dominick Cruz compete since dropping the bantamweight championship to Cody Garbrandt at UFC 207 in a unanimous decision defeat. But prior to that, Cruz had never lost in the UFC and was on a remarkable 13-fight winning streak. Dominick Cruz currently owns one of the best records in the UFC at 22-2 and considered by many to be the greatest bantamweight of all time. And the wait to see the legend return to action will come to an end on January 26th. Who gets the win in this bantamweight clash? 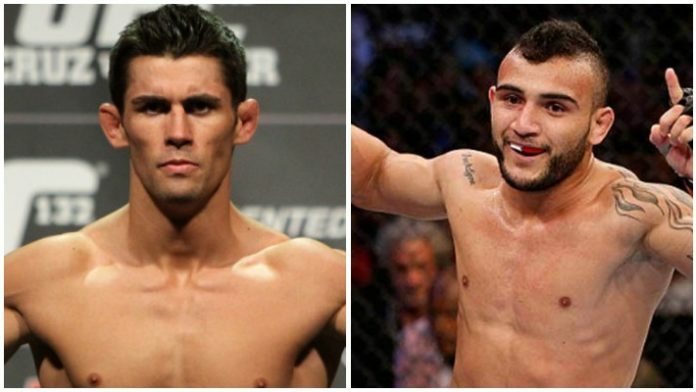 Dominick Cruz or John Lineker?